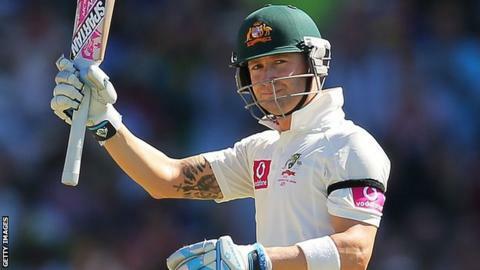 India enjoyed the better of the opening day of the second Test in Hyderabad despite another fine knock by Australia captain Michael Clarke. Seamer Bhuvneshwar Kumar took three wickets to reduce Australia to 63-4 before Clarke (91) and Matthew Wade (62) put on 145 for the fifth wicket. However, once Wade was dismissed the Aussies lost five wickets for 28 runs. Clarke declared on 237-9 to leave India with a tricky three overs to survive, which they achieved by reaching 5-0. India lead the four-match series 1-0 and it needed another sparkling innings from Clarke to prevent the Aussies being skittled after electing to bat first. Australia's Michael Clarke averages more than 70 with the bat as skipper, compared to a career average of 52.96. Since taking over the captaincy from Ricky Ponting after the 2011 World Cup, Clarke has scored a wealth of runs - including two double centuries, two hundreds and four half-centuries in his last eight Tests. And he was again the glue holding the Australian batting order together after the early damage wreaked by Kumar, playing in only his second Test. Openers David Warner and Ed Cowan were both dismissed for single-figure scores before Shane Watson was pinned lbw and Ravi Ashwin chipped in with the wicket of Phil Hughes. Clarke and Wade rescued the situation, with the skipper playing a more aggressive role - hitting nine fours and a six in his 186-ball knock. Wade, playing through the pain of a fractured cheekbone, was happy to compile a patient half-century and Australia seemed to be taking control when the wicketkeeper batsman was caught at point by Kumar off Harbhajan Singh. That brought about a collapse with Moises Henriques, who scored 68 and 81 not out in the first Test, being deceived and bowled by the spin of Ravindra Jadeja. The wickets continued to fall, with Jadeja also getting rid of Glenn Maxwell before Harbhajan trapped Peter Siddle in front. Clarke was last out when, attempting to add quick runs, he aimed a slog across the line to Jadeja and was bowled by one which kept low. A positive declaration followed, but India openers Murali Vijay and Virender Sehwag managed to survive until the close. Speaking on Sky Sports at the close of play, Wade said Australia were happy with their batting performance. "In the last 90 minutes of the day, the pitch started to take more turn," he said. "We think 237 is enough if we bowl well. "We need to hit the stumps and create opportunities for ourselves."